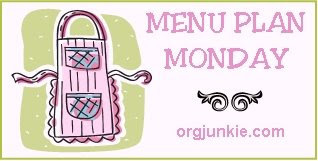 So this week's menu is a lot of leftovers of things we didn't eat last week. I am trying to clear out the fridge, freezer and pantry so I can do a really good cleaning without fear of Miss Dumps-Everything-Out making a ginormous mess in my kitchen. Saturday is grocery day this week and I'll be making a new menu for next week based on what's on sale. OK, now for my earth shattering big organizational tip. Are you ready? Good. I'm short. This isn't a newsflash to those who know me IRL, but online people, I'm short. I also have tall cabinets. This is not a good combination. I'm constantly after D to get things down for me. The other alternative is standing on a chair but that requires far more effort on my part. To solve this problem of making my spices easily accessible, I purchased three of these plastic cube boxes for storing CDs from the dollar store. I labeled one for SPICES and put all the spices I use for cooking in it. The other is labeled BAKING and contains things like food coloring, cinnamon, vanilla, etc. I also have one specifically for seasoned vinegars and oils. When it's time to cook or bake, I just pull down one box and rummage through. It keeps everything so nice and neat. 100 days til Christmas? Are you KIDDING?